Operational Support Services. I am a Subject Matter Expert registered with N.C.P.E. evidence by the use of dogs and facilitate training. 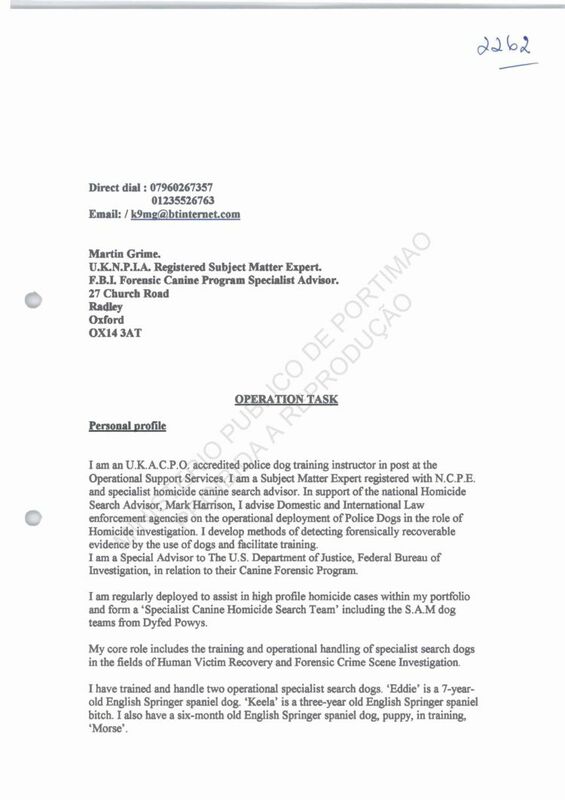 Investigation, in relation to their Canine Forensic Program. in the fields of Human Victim Recovery and Forensic Crime Scene Investigation. equipment which does not contact. incinerated remains even if large quantities of accelerant have been involved. deployed in a boat where a large area may be covered using a gridding system. being completed by scent discrimination exercise at a suitable venue. 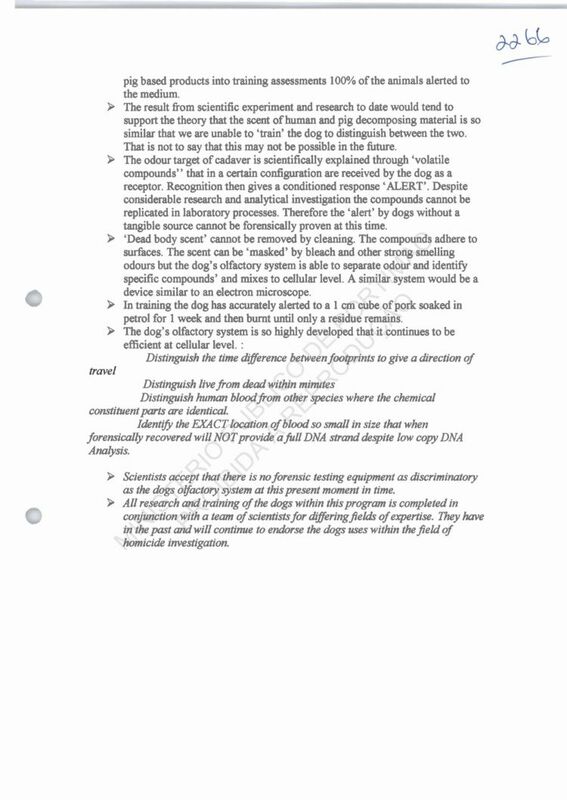 The dog will alert to the presence of 'dead body' scent whether it is at source or some distance away from a deposition site. This enables the use of the dog to identify the exhaust of the scent through fissures in bedrock or watercourses. A geophysical survey of the area will then reduce the size of the search area. environment. This is completed in a scent discrimination exercise where controls may be included to increase assurty. taken from motor vehicles, property or scenes by a ST100 Scent Transference Unit. stored for use within scent discrimination exercises. contamination. 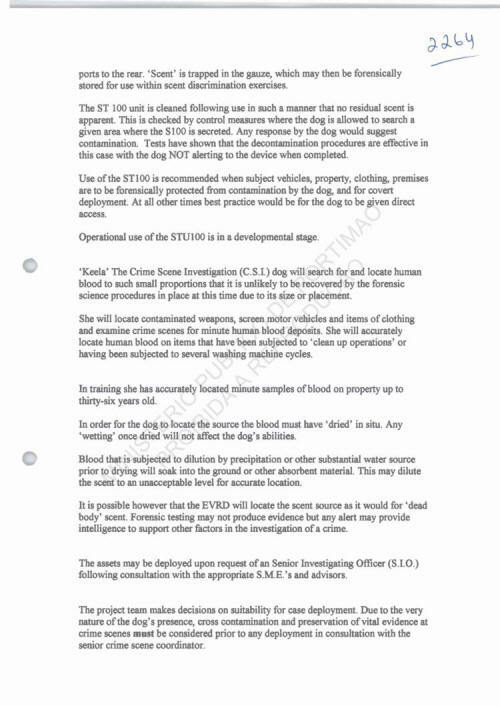 Tests have shown that the decontamination procedures are effective in this case with the dog NOT alerting to the device when completed. deployment. At a11 other times best practice would be for the dog to be given direct access. Operational use of the STÃ¼100 is in a developmental stage. science procedures in place at this time due to its size or placement. having been subjected to severa1 washing machine cycles. 'wetting' once dried will not affect the dog's abilities. the scent to an unacceptable leve1 for accurate location. intelligence to support other factors in the investigation of a crime. following consultation with the appropriate S.M.E. 's and advisors. type in the world. 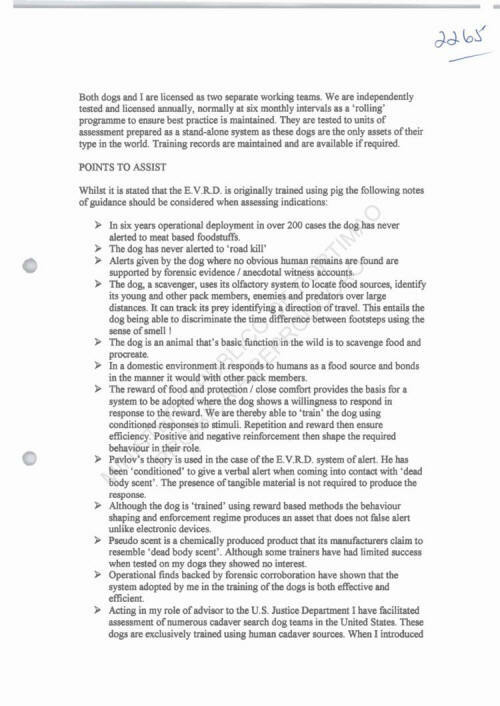 Training records are maintained and are available if required. alerted to meat based foodstuffs. supported by forensic evidence I anecdotal witness accounts. in the manner it would with other pack members. when tested on my dogs they showed no interest. pig based products into training assessments 100%! of the animals alerted to the medium. similar that we are unable to 'train' the dog to distinguish between the two. That is not to say that this may not be possible in the future. receptor. Recognition then gives a conditioned response 'ALERT'. 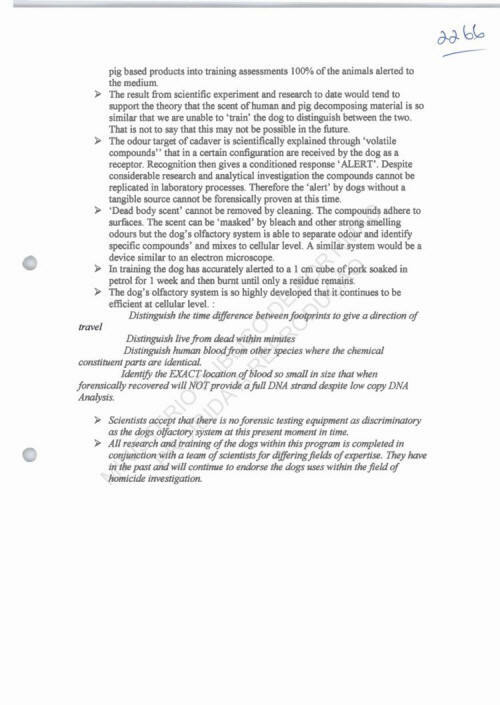 Despite considerable research and analytical investigation the compounds cannot be replicated in laboratory processes. Therefore the 'alert' by dogs without a tangible source cannot be forensically proven at this time. device similar to an electron microscope. petrol for 1 week and then burnt until only a residue remains. Distinguish the time difference between footprints to give a direction of travel. Distinguish live from dead within minutes. Distinguish human blood from other species where the chemical constituent parts are identical. a full DNA strand despite low copy DNA analysis. > Scientists accept that there is no forensic testing equipment as discriminatory as the dogs olfactory system at this present moment in time. 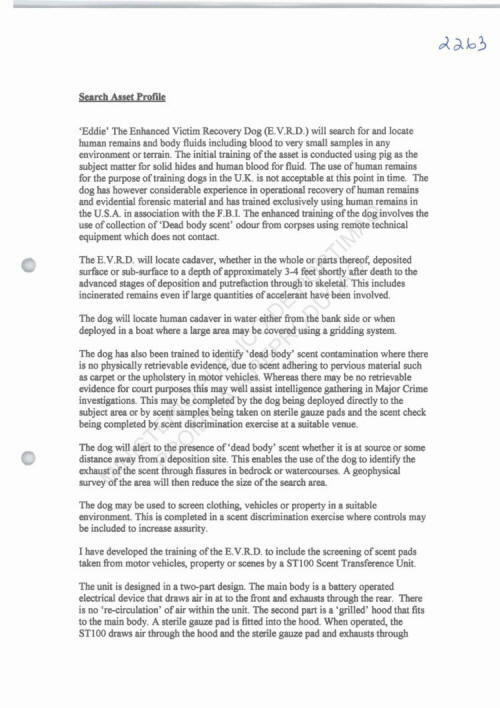 >All research and training of the dogs within this program is completed in conjunction with a team of scientists for differing fields of expertise. within the field of homicide investigations. A missing person, last seen returning from church, on foot, in N. Ireland. A missing person search did not reveal her whereabouts. 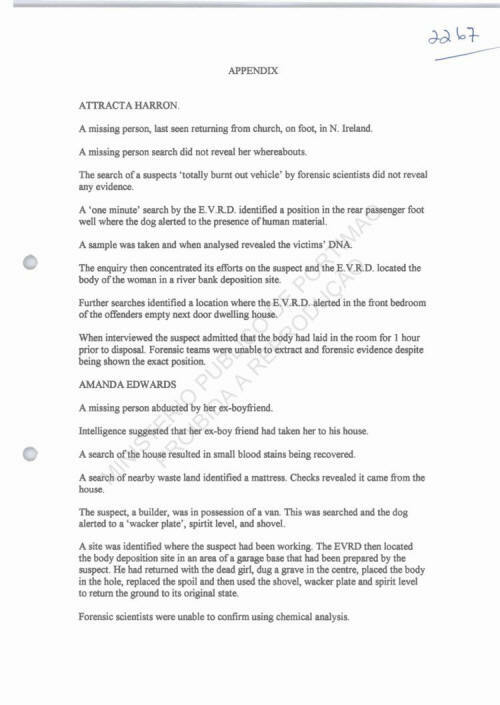 The search of a suspect's 'totally burnt out vehicle' by forensic scientists did not reveal any evidence. A 'one minute' search by the EVRD identified a position in the rear passenger footwell where the dog alerted to the presence of human material. A sample was taken and when analysed revealed the victim's DNA. The enquiry then concentrated it's efforts on the suspect and the EVRD located the body of the woman in a river bank deposition site. Further searches identified a location where the EVRD alerted in the front bedroom of the offender's empty next door dwelling house. When interviewed the suspect admitted that the body had laid in the room for 1 hour prior to disposal. Forensic teams were unable to extract any forensic evidence despite being shown the exact position. A missing person abducted by her ex-boyfriend. Intelligence suggested that her ex-boyfriend had taken her to his house. A search of the house resulted in small blood stains being recovered. A search of nearby waste land identified a mattress. Checks revealed it came from the house. The suspect, a builder, was in possession of a van. This was searched and the dog alerted to a 'wacker plate', spirit level, and shovel. the body deposition site in an area of a garage base that had been prepared by the suspect. He had returned with the dead girl, dug a grave in the centre, placed the body in the hole, replaced the spoil and then used the shovel, wacker plate and spirit level to return the ground to its original state. Forensic scientists were unable to confirm using chemical analysis. 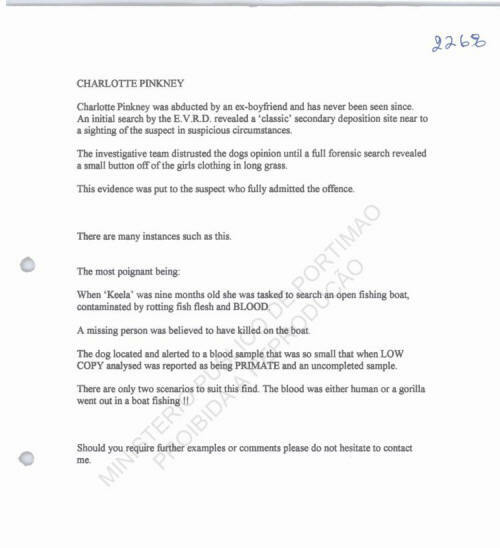 Charlotte Pinkney was abducted by an ex-boyfriend and has never been seen since. An initial search by the EVRD revealed a 'classic' secondary deposition site near to a sighting of the suspect in suspicious circumstances. The investigative team distrusted the dogs opinion until a full forensic search revealed a small button off of the girls clothing in long grass. This evidence was put to the suspect who fully admitted the offence. There are many instances such as this. When 'Keela' was nine months old she was tasked to search an open fishing boat, contaminated by rotting fish flesh and BLOOD. A missing person was believed to have killed on the boat. 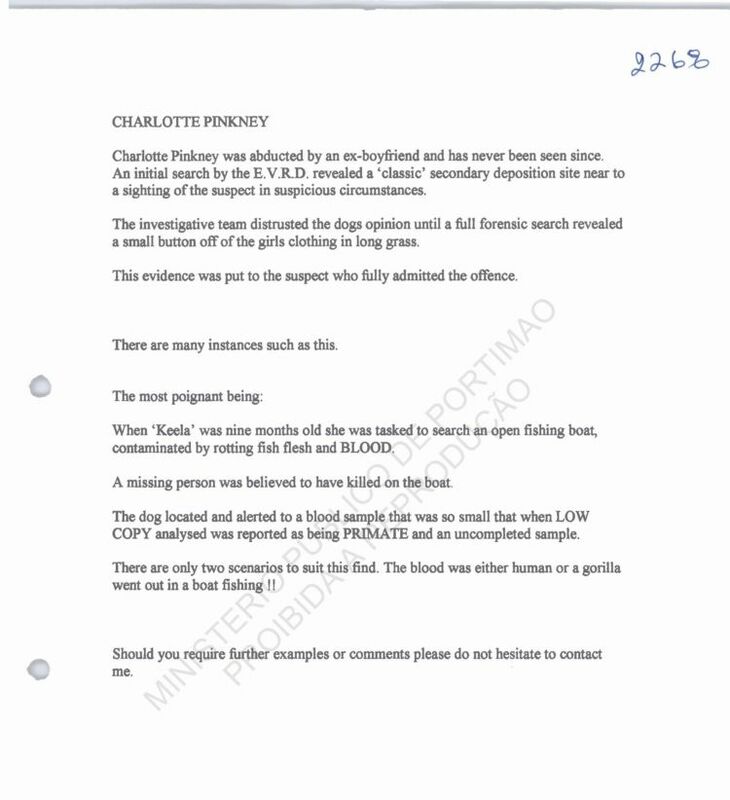 COPY analysed was reported as being PRIMATE and an uncompleted sample. There are only two scenarios to suit this find. The blood was either human or a gorilla went out in a boat fishing ! ! Should you require further examples or comments, please do not hesitate to contact me.